Every ecosystem is unique. There are some processes, however, that are the same in every ecosystem. One of these is energy flow. This process allows an ecosystem to function and survive. The source for all ecosystems in the Sun. Light energy from the Sun hits Earth and plants trap some of this energy using the chlorophyll in their leaves. This process is called photosynthesis. Plants use the light energy to convert simple materials into a form of sugar they can use to grow. Plants produce their own energy, so they are called autotrophs. Describe the process of photosythesis, including the simple materials that are used and produced. 'Photosynthesis is necessary for the survival of all organisms on Earth'. Justify this statement. When other organisms eat plants, some of this energy-rich sugar is passed on to them. Organisms that get their energy from consuming other organisms are known as heterotrophs. Cellular repiration is the series of reactions that occur in an organism's cells to release energy from sugar. Organisms need this energy to stay alive, grow, move, think and carry out all the vital bodily functions. All living things undergo cellular respiration. Compare the chemical equation for photosynthesis and the equation for cellular respiration. What do you notice? A food chain shows how energy flows from one organisms to another in an ecosystem. There are four classifications of organisms in a food chain. Plants produce their own energy (glucose). They are known as producers. After the producers are three levels of consumers. Consumers are then further labelled; carnivore, herbivore and omnivore. Omnivores eat both meat and plants. Primary consumers feed only on plants (the producers). These are called herbivores. A secondary consumer feeds on herbivores. It may be an omnivore or a carnivore. Tertiary consumers feed on secondary consumers. What happens to the energy after it is consumed? Eventually, all organisms in the food chain die and become food for micro-organisms, such as bacteria and fungi. These micro-organisms break down dead plants and animals and are known as decomposers. Draw your own food chain. Food chains represent the energy flow of specific organisms - not a whole ecosystem. A food web is created by linking different food chains together. A food web represents the energy flow of an entire ecosystem. 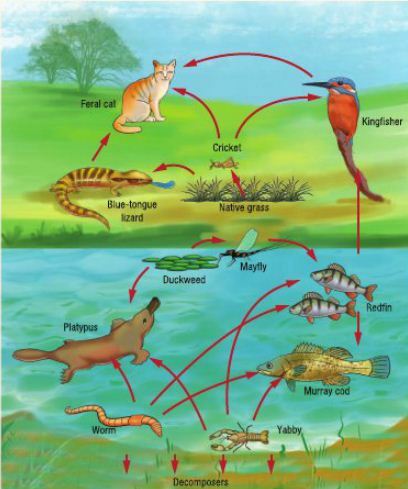 Food webs help scientists predict what could happen if one of the organisms in the food web was disrupted in some way. What is a food web made up of? Why are producers always at the bottom of a food chain or web? Why do organisms need cellular respiration? Explain the difference between a food chain and a food web? Use the picture below to answer the following questions. 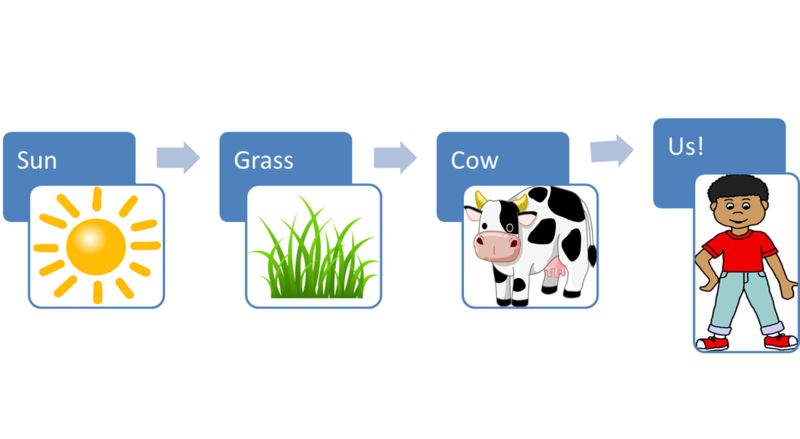 a) State which organisms are producers and which are consumers. b) Give an example of a herbivore, an omnivore and a carnivore. c) Explain the diference between an autotroph and a heterotroph, and give an example of each. d) A food web shows the links between various food chains. Write down three food chains that are found in this food web. e) What effect does the feral cat have on the food web? f) Explain what might happen if the European rabbit was introduced into this community.